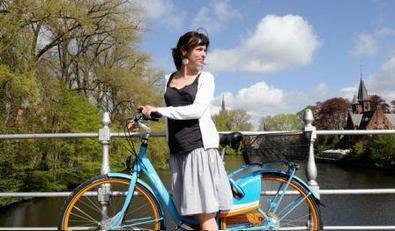 Blue-bike is Belgium's national bicycle sharing scheme, initiated by Fietsenwerk and National Railways. It is inspired by OV-Fiets in The Netherlands. Train and bike; it is a successful combination. Nearly 20 per cent of train travellers cycle to the station, with top cycle destinations such as the train station of Antwerp-Berchem having a total of 38 per cent. The number of cycle parking spaces at Belgian stations has reached 77 000 and will probably exceed this number in the very near future. Folding bikes are also becoming common on Belgian commuter trains. Added to that, local bicycle renting schemes are gaining momentum and becoming more and more popular. With the bicycle sharing service Blue-bike, FietsenWerk and the holding behind Belgian National Railways (NMBS-Holding) aim to foster and encourage this development. By offering a national rental service (inspired by OV-Fiets in The Netherlands), the initiators want to offer a flexible and simple solution, making it easy for users to reach their final destination after the trip by train. As such it is a valuable alternative, one that is good for both the environment and people's health. Bicycles are available in 40 train stations located throughout Belgium. More and more stations are joining the list as the service becomes more popular. In the bicycle point users can collect a Blue-bike on production of a member card and when the bike key is scanned. Renting is available from 07:00 until 19:00 every working day. Renting a bicycle is rather simple. Potential users must become subscribers first. The amount for a one-year membership is € 10. Registering is possible via the website or in one of the 11 bicycle points across Belgium. Once registered, a member card is sent to a user's home address. The card grants access to the Blue-bikes. With one card it’s possible to rent two bikes to enable users to team up with their friends, partners or family. Renting a bike for one day costs € 3 and is allowed for 18 hours. Payment is monthly (through direct debit or credit card). Users can check their balance via the website at any time. Blue-bikes must be returned to the station of departure. The bicycle is then scanned again. That doesn’t mean it can’t be returned after closing time; this is possible by leaving the key in the Blue-bike key deposit box. The Bicycle Point Team will make sure that the key is correctly re-scanned afterwards. Blue-bike also offers a simple and sustainable mobility alternative for companies and professional users. For all business/service trips: outdoor meetings; appointments with clients; lunch appointments in different locations, etc. For the last few kilometres to a business: for visitors and applicants. Vouchers have also been added to the initiative. The vouchers (cards or codes) are valid for a single use of a Blue-bike, and can be passed on or mailed to visitors or others. The launch price is € 4 per voucher. In August 2012, Blue-bike launched automatic rental terminals in two major train stations: Brussels-Central and Antwerp-Central. These terminals enable users to rent 24 hours a day and 7 days a week. In September 2012, 32 more automatic street terminals were installed. The bikes are sturdy but fashionable city bikes fitted with 3-speed Shimano gears, ergonomic handle bars and state-of-the-art brakes. For the user's convenience, the bicycles have various comfort features such as trouser protection, mudguards, adjustable seats and a handy basket. The bicycles are maintained by the Bicycle Points, which are social profit organisations. Initiating partners of Blue-bike are Fietsenwerk (the umbrella organisation of the Bicycle Points) and the NMBS-Holding. Supporting partners are Eneco, the Federal Administration for Transport and Mobility, the National Lottery and the Flemish Government. Blue-bike was launched in 2011. In March 2012, there were 1 300 registered users, who made 500 trips per month. Blue-bike expects the same slow but steady growth process as the famous OV-Fiets in The Netherlands, one of the examples Blue-bike is inspired by. Blue-bike expected to hit 5000 users by the end of 2012.